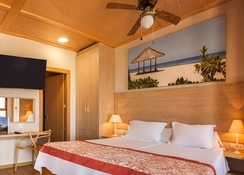 Magic Natura Animal, Waterpark Resort is a four-star family friendly luxury hotel created around the concept of bungalows and villas right in the middle of a tropical forest. Give free rein to all your five senses when you settle into the hotel built inside an animal and marine park in the style of a Polynesian lodge. Families can indulge in day and night safaris where there are apparently no visible barriers between animals and the human guests. The 320,000 square metre park is divided into four themes: Pangi, America, Europe and Asia. The 249 theme lodges made of wood and heather offer amazing views of the sea, pool or meadow frequented by elephants. The resort features a water park with wave pool, slides and children’s pool, Balinese-style infinity pool with Jacuzzi, swimming pools for adults and kids as well as a spa offering a range of health and beauty treatments. The hotel’s first-rate restaurants and bars provide a sumptuous gastronomic experience to its guests. The resort is located amid beautiful natural surroundings barely 4 km away from the beaches of Lavante and Poniente. The Benidorm harbour is 4 km away from the hotel. The Alicante airport is at a distance of 48 km from the hotel. 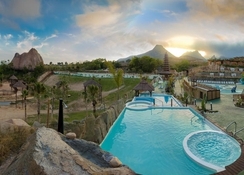 Magic Natura Animal, Waterpark Resort provides a unique experience of living in posh villa-type accommodation inside a Polynesia-style resort. 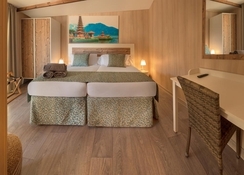 There are 249 Balinese-inspired lodges made of wood and heather that come in categories like Tahiti/Bali Yacht Club Lodge, Tahiti/Bali Sea View Lodge, Polynesian Supreme Standard, Polynesian Supreme Sea View, Polynesian Supreme Pool Club, Polynesian Jacuzzi Yacht Club, Polynesian Elephants Observatory, Polynesian Supreme Sea View Jacuzzi yacht Club and Tahiti/Bali Supreme Lodge. 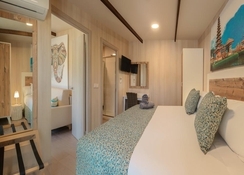 Tastefully furnished, these air-conditioned rooms are furnished with queen-size beds, sofa beds and bunk beds, satellite TV, microwave, refrigerator and terrace. Some of the rooms come with outdoor Jacuzzi and offer marvellous views of the sea, pool and even meadows of elephant views. There’s a clutch of fine restaurants and bars at the hotel that present guests with an array of cuisines from across the world. There are Tuvalu 1 and Tuvalu 2 buffet restaurants serve all major meals in a great ambience. They also offer diet and vegetarian menus. Tangaloa is a terrace restaurant dedicated to meat dishes from 5 continents. There are also five bars and cafes that serves drinks and light-bites. These include Bar La Palapa, Rapanui Bar, Agung Vulkaan café, La Pagoda Taman Ayun lounge bar with chill-out terrace and Waterpark Magic Natura Bar inside the Waterpark Aqua Natura. The hotel features a massive water park that allows parents to quietly rest and relax while the kids can have fun in the water. This park has attractions like wave and infinity pools, slides, children’s pool, spa and sun deck. There is also a gym, Jacuzzi, expansive gardens to chill out and lounge on a hammock. 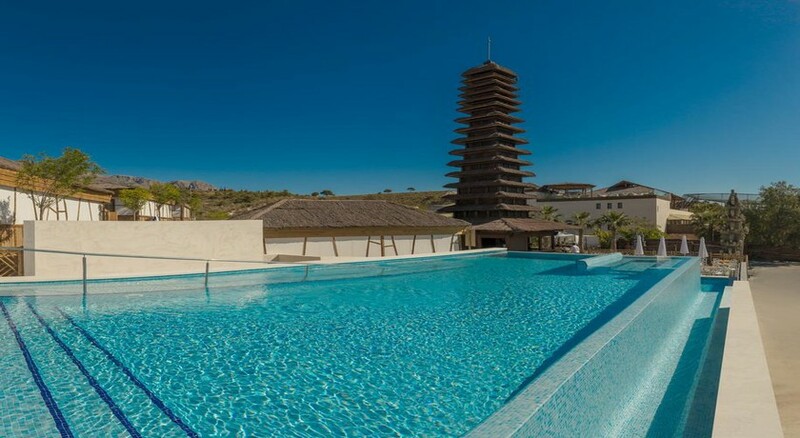 Water lovers can enjoy at the on-site swimming pools and an infinity pool with Jacuzzi for both adults and kids. 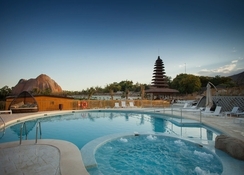 The hotel’s spa offers therapeutic massages and a number of beauty treatments. The wildlife park Terra Natura Zoo, spread over 320,000 square metres, offers a new concept ‘Zooimmersion’, where guests can come into contact with the animals as if there are no barriers them. There are also environmental workshops and natural sciences laboratories that help children to learn about the natural world. The hotel participates in programmes for the protection of endangered animals, like rehabilitation of predatory birds.